"A powerful work of scholarship, Continental Divides will become a model for reconceiving American literature, culture, and history in a complex international context. Adams's work on North American literature and culture will be highly significant." - Jose David Saldivar, University of California, Berkeley"
North America is more a political and an economic invention than a place people call home. Nonetheless, the region shared by the United States and its closest neighbors is an intriguing frame for comparative American studies. 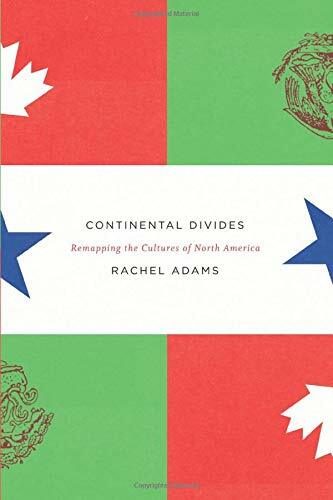 "Continental Divides" is the first book to study the patterns of contact, exchange, conflict, and disavowal among cultures that span the borders of Canada, the United States, and Mexico. Rachel Adams considers a broad range of literary, filmic, and visual texts that exemplify cultural traffic across North American borders. She investigates how our understanding of key themes, genres, and periods within U.S. cultural study is deepened, and in some cases transformed, when Canada and Mexico enter the picture. How, for example, does the work of the iconic American writer Jack Kerouac read differently when his Franco-American origins and Mexican travels are taken into account? Or how would our conception of American modernism be altered if Mexico were positioned as a center of artistic and political activity? In this engaging analysis, Adams charts the lengthy and often unrecognized traditions of neighborly exchange, both hostile and amicable, that have left an imprint on North America's varied cultures.